The deadline for applications for this award has passed. We look forward to announcing the winners of the women’s prize in coming months. 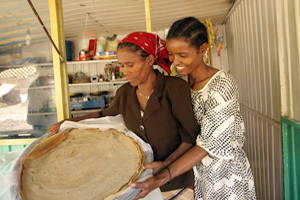 In March 2014, Caritas Internationalis and the Fidel Götz Foundation launched the Women Sowers of Development Prize to honour the role of women in solving world hunger. In every region, women have less access than men to resources like land. If the opportunities were level, women could raise their farm productivity by 20-30 percent. Globally that would lift 100-150 million people out of hunger. When women control additional income, evidence shows they spend it on food, health, clothing and education for their children. The 2014 Women Sowers of Development Prize consists of two prizes of €10,000 each. One category is aimed at programmes supported by Caritas national organisations. The other is aimed at bodies outside the Caritas network. Applications were received in spring 2014 and the winners will be celebrated on International Woman’s Day in 2015. The Fidel Götz Foundation also supports Voices of Faith, in which Catholic women describe how their faith has positively impacted their life, greater society and the world. On 8 March 2014, at the first ever Voices of Faith storytelling event, 11 remarkable women from different countries shared their personal stories. Voices of Faith aims for a connection of ideas from a female perspective that can build a better future. Caritas Internationalis is the humanitarian and development organisation of the Catholic Church. The confederation has over 160 member organisations around the world. The Fidel Götz Foundation is a charitable trust. The Foundation Board prioritises the following values: trust, education and courage.